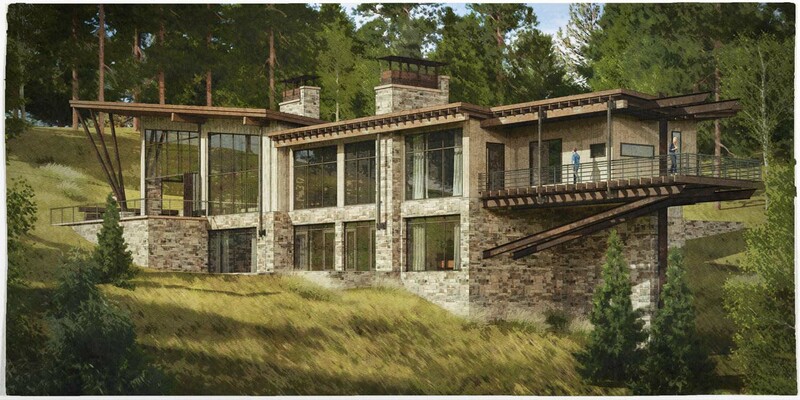 Centre Sky Architecture’s newest custom residential design is located high up in the mountains at an elevation of over 8,100 feet. The views from the site are incredible, with Lone Mountain, the Spanish Peaks, and the Gallatin Range all view-able from the lot. This made for unique design options to incorporate the beautiful scenery into the views from the house. The Mountain Modern design incorporated steel and glass to open up all the possible views. The expansive great room blurs the lines from inside to outside. Large glazing from floor to ceiling along with a lift-and-slide retractable window give you access to the gorgeous surroundings.